Am I the only person who hadn’t heard of this place before?? (I’m assuming the answer is YES). 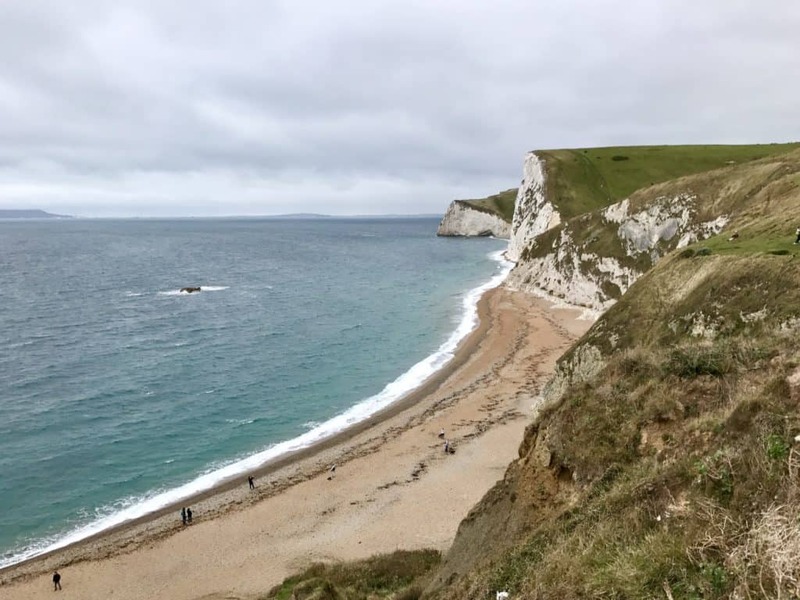 As I was doing research for our stay in Torquay, along England’s southern coast, the Jurassic Coast was one of the first places that popped up. 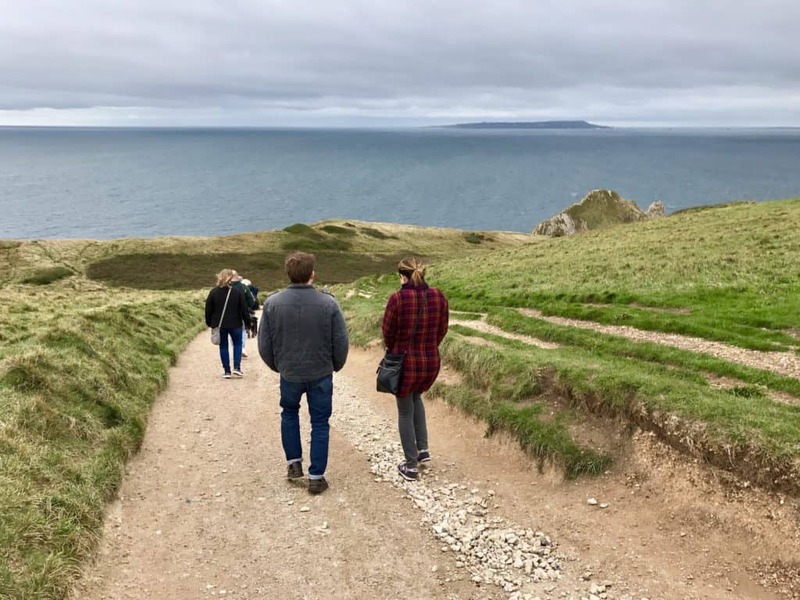 When I realized that the Durdle Door—which I’d seen for years on Pinterest—was only a couple hours away from where we’d be staying, I knew we needed to make a day trip out of it! 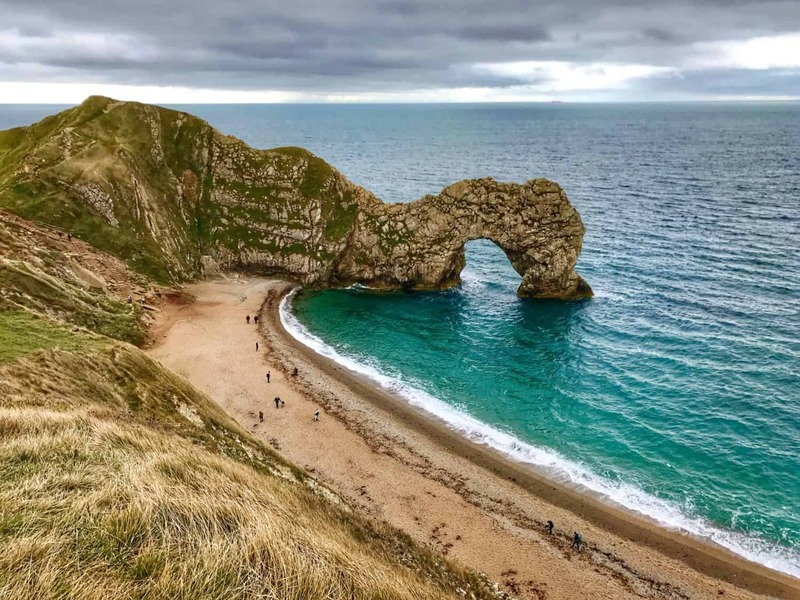 The Jurassic Coast is a 95-mile stretch of coastline in southern England (between East Devon and Dorset) offering beautiful villages and dramatic coastal views, and is considered one of the most picturesque areas in the country. 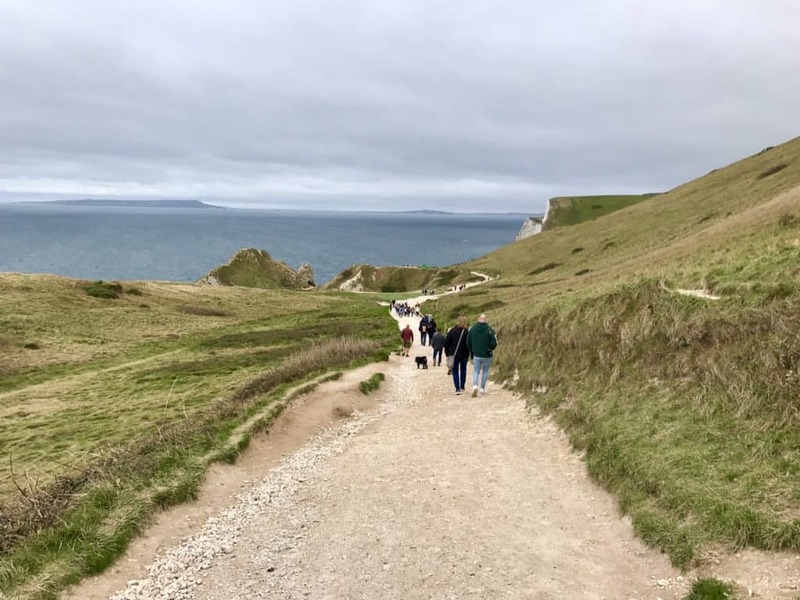 The coastline is of such international geological importance that it was designated England’s first natural UNESCO Natural World Heritage Site, alongside natural wonders like the Grand Canyon and the Great Barrier Reef. 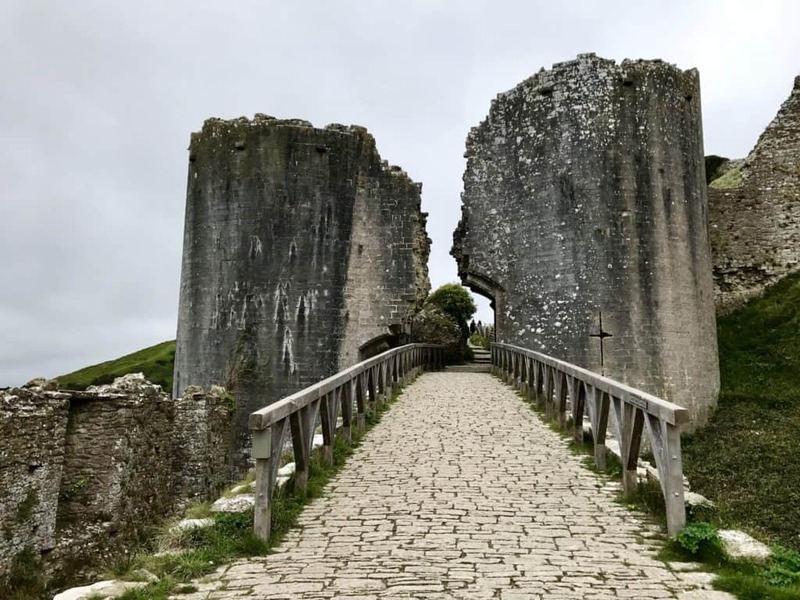 There are SO many places to visit along the coast that you could easily spend a few days driving up and down, exploring nooks and crannies, and hiking. We were visiting as a day trip from Torquay, on the coast in Devon, so had to be really choosy given our limited time. 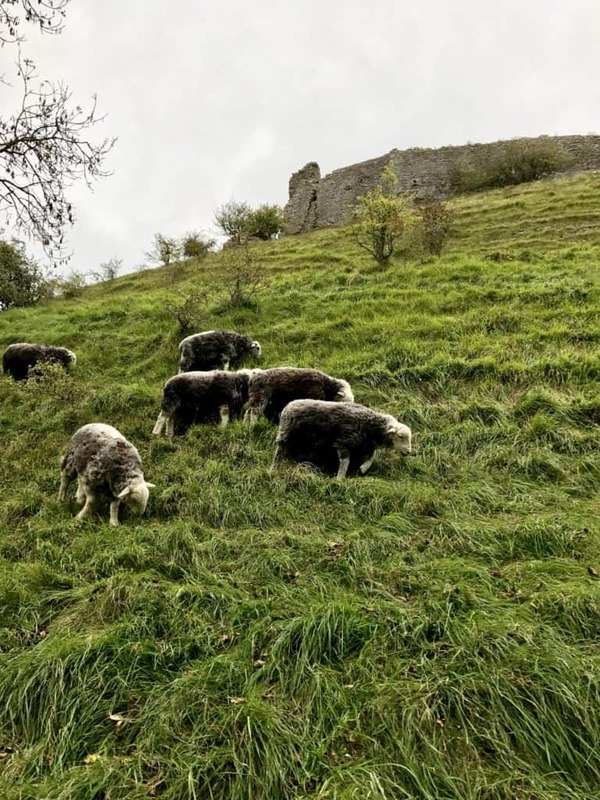 One of the things we considered when picking what to visit was trying to see different types of sites rather than only gorgeous coastal cliff views. So we got the iconic Durdle Door, the historical ruins of Corfe Castle, the gentle seaside of Lyme Regis, and then caught impressive Exeter cathedral on our way back. We got a pretty early start, because we knew we had a ton of driving to do. Our first stop (after topping up the gas tank) was the iconic Durdle Door, something I’d seen on Pinterest for years but never actually knew where it was located. It’s a super cool limestone arch that’s been carved by the sea over centuries (or millennia). It’s easy to find, lots of signage and you can use GPS to find it. There’s a big parking lot (make sure you pay!) and then only one path down, so you can’t get lost. There’s no charge for admission, only parking. The path down to the beach is very steep, but well cared-for. The only reason it was so hard for me was because I was in the walking cast (and boy, was the way back up BRUTAL! ), but because it’s steep and gravel you need to be careful—I saw a lady totally bite it, and she scraped up her hands and knees pretty badly. DREAMY. Even with the stony overcast, windy, and misty day we had, the water color was gorgeous and the whole thing felt magical. I can only imagine what a beautiful sunny day would be like. We were pretty starving and windblown at this point, so we decided to try and find food before making our next stop. After quite a bit of driving around (and having the darnedest time finding parking), we landed on The Castle Inn right by Corfe Castle (not to be confused with the more famous thatched roof one in Lulworth). 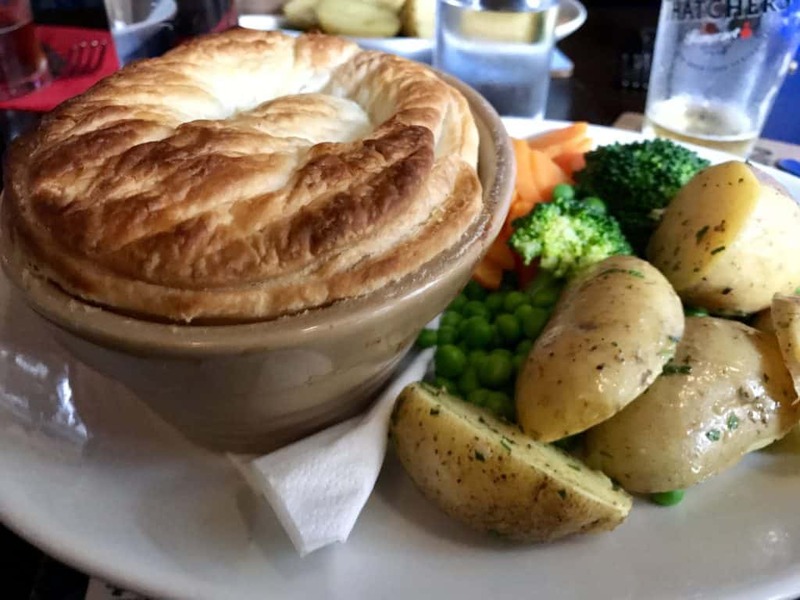 They have a small parking lot, which was a blessing, and it’s a super cute, cozy little place to grab a delicious steak & ale pie and a cider. There’s a lovely little back patio garden as well, which would be nice when it’s warmer. 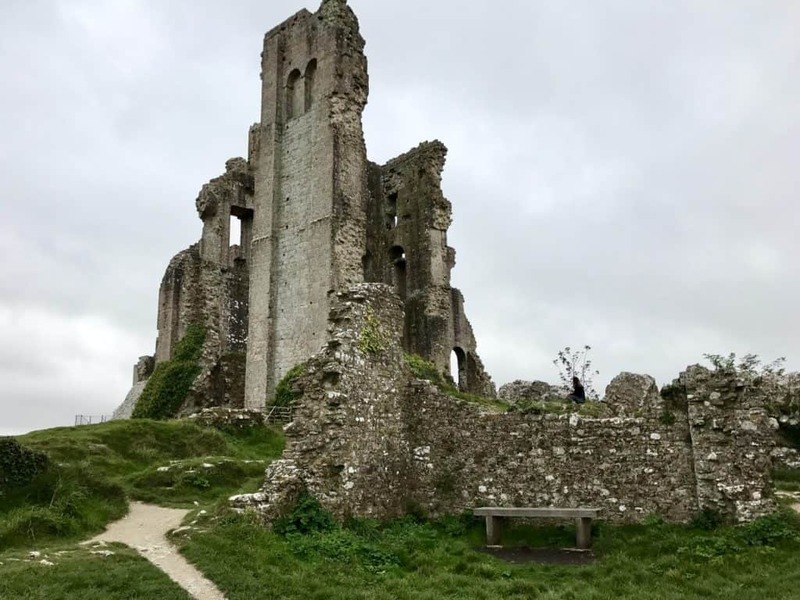 Our next stop was Corfe Castle, which is a pretty impressive ruins on the Isle of Purbeck. 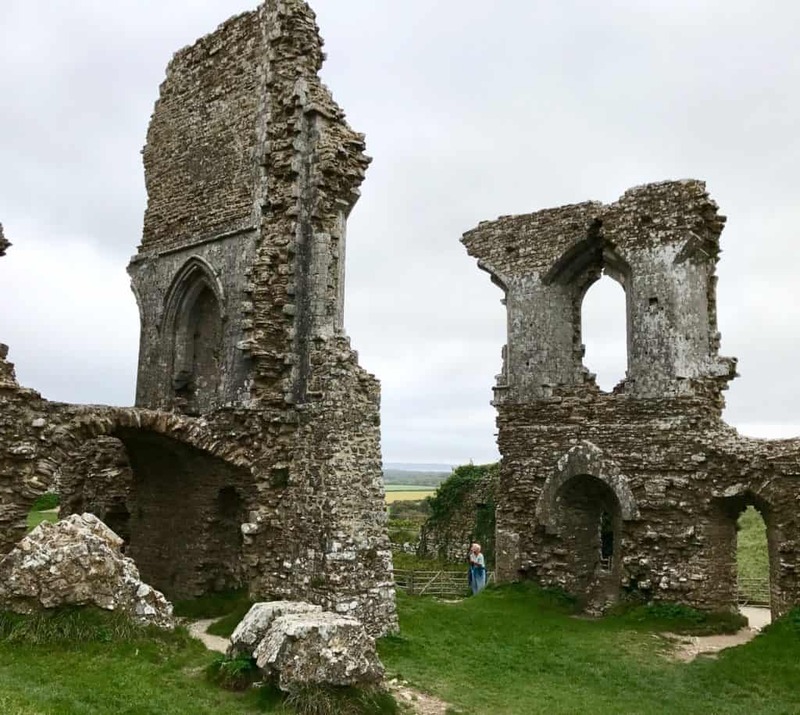 Built by William the Conqueror in the 11th century, it looks like a giant drunkenly knocked his building blocks over. The castle is absolutely massive, very cool. It was also a pretty taxing walk (and climb) with my cast, so I didn’t enjoy quite as much as I would have otherwise, but there’s no way you can walk around the ruins and not be in awe of the size and scope. The view of the countryside is pretty awesome as well. There were quite a lot of art students there sketching, and Abigail took the opportunity to do some art of her own (the second picture below). I couldn’t resist grabbing a picture, because she looks so tiny compared to that massive column! The day was really getting away from us at this point, so we headed back west toward Torquay. As we neared Lyme Regis, we decided to turn off the main road to quickly see the town. We were cruising downhill toward the beach and saw a sign for a scenic viewpoint on the left with a large parking lot, so cranked the wheel and decided to give it a try. It was really lovely, with a nice staircase down to the beach. We didn’t go all the way down due to time, but took a few minutes to enjoy the view and the blue skies that we finally were graced with. Once we got down to the main drag, we nabbed a parking place and found a cute little cafe to grab a piece of cake and a coffee to go. The town is known for fossils, and is a hoppin’ Jurassic Coast resort town in the summer. In early October when we were there, it was definitely more chill. At this point, we were trying to figure out our game plan, and decided to race to Exeter and try to see the famous cathedral before it got dark. We found street parking and I managed to get us in a parallel parking spot (something I got quite a bit better at as our trip wore on), then we set out in the rain to explore. Compared to the little villages we spent all day walking through, Exeter is a lively, happening place (partly due to the university). 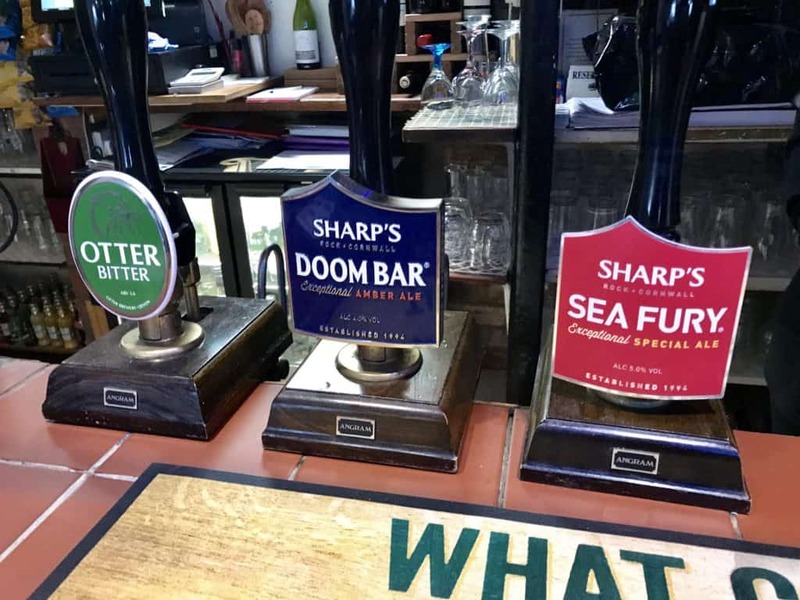 There’s a lot of nightlife, tons of pubs, bars, and restaurants, adorable Georgian streets, some Roman ruins, and one of the most famous cathedrals in the UK. The cathedral here was founded in 1050 though the present building was finished around 1400—they actually kept a lot of the original Norman building, however. It is CRAZY detailed (similar to Salisbury’s famous cathedral, which I’ll do a separate post on), and cuts an imposing figure just standing all by itself on a flat plaza. We grabbed a quick drink but weren’t hungry enough to stay for dinner and were quite tired from the day, so headed back to Torquay—an easy enough highway drive down from Exeter to the coast. Though, wow, people FLY along that highway! We did this as a day trip from Torquay, so could only see a few places. But you could easily do 2-3 days along the coast and really explore, hike, discover off-the-beaten-path villages, and generally relax. If you go nowhere else, make sure you see the Durdle Door. Just enter it into your GPS (and you can follow signs easily), and then there’s a massive car park (make sure you pay). There’s a steep footpath down, or your can walk over the hill from Lulworth Cove if you prefer. 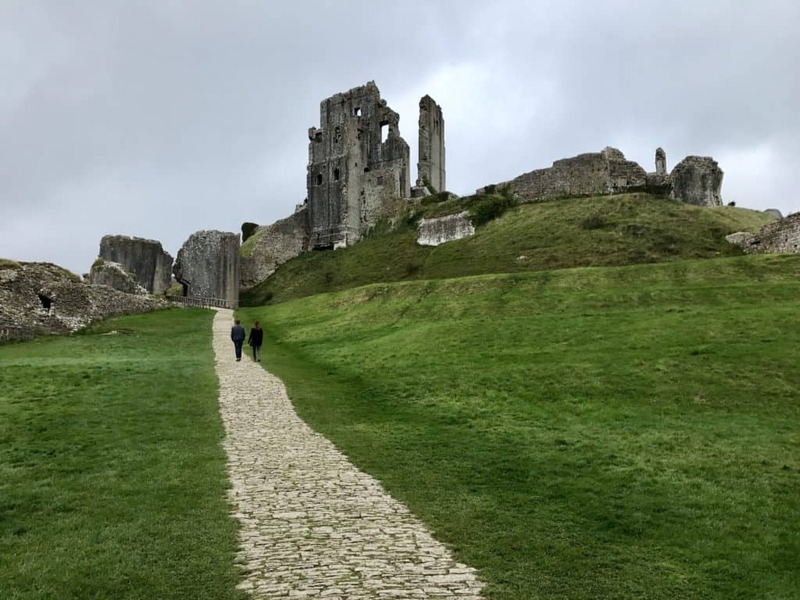 We had trouble finding the right parking for Corfe Castle, and ended up parking on the side of the road and taking a weird back path around. Parking: There’s an official National Trust car park (£2.00) or should be a free one nearby as well. Hours: Make sure to check the official website, differs based on whether it’s peak season or winter. 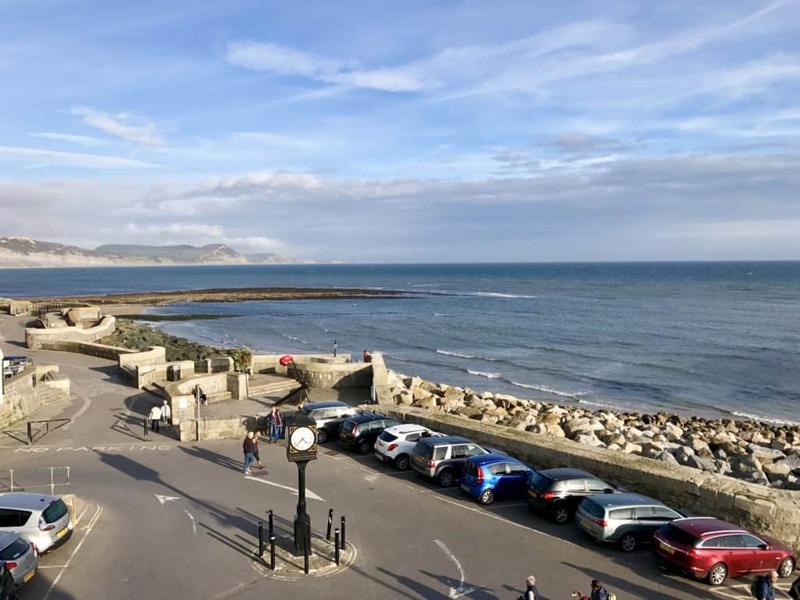 Lyme Regis is easy enough to find (GPS and signs aplenty), and you can make a quick stop or spend the night here on a longer Jurassic Coast trip. Exeter isn’t on the Jurassic Coast, but it’s an easy thing to pair with a day on the coast, or a great place to base yourself for the night. Again, GPS and signs will get you anywhere you need to go, it was really easy to navigate through the city. Lulworth Cove: A beautiful, almost-circular bay with just a small opening to the sea. There’s a car park and visitor centre in the village and it’s just a short walk to the beach (should be walkable to the Durdle Door too). West Bay: AKA Broadchurch (the cliff has had a starring role in the TV show Broadchurch and so attracts David Tennant fans). The cliff juts out of the sand dunes and is a really cool sight. Studland Beach: As well as beautiful natural sights, it offers interesting WWII history. It was used for D-Day rehearsals because of its similarity to the beaches of northern France. The rehearsals used live ammunition and a new type of tank, and you can still see pillboxes on the beach and visit Fort Henry. Bournemouth: A seaside resort with 11 kms of beaches, Victorian architecture and buzzing nightlife. It felt kind of overtouristed to me, but could be a great place to base yourself or stay if you have kids in particular, home to Bournemouth Pier—an activity center with an obstacle course, a climbing wall and a zip line. We used Sixt rental car, who I’ve used several times internationally. This link gets you 25% off a UK rental, or this one is 10% off a Europe rental if that’s helpful. Have you visited the Jurassic Coast? What other towns or sights do you recommend?